Discussion in 'Social Discussion' started by coffeeowl, Jan 19, 2016. 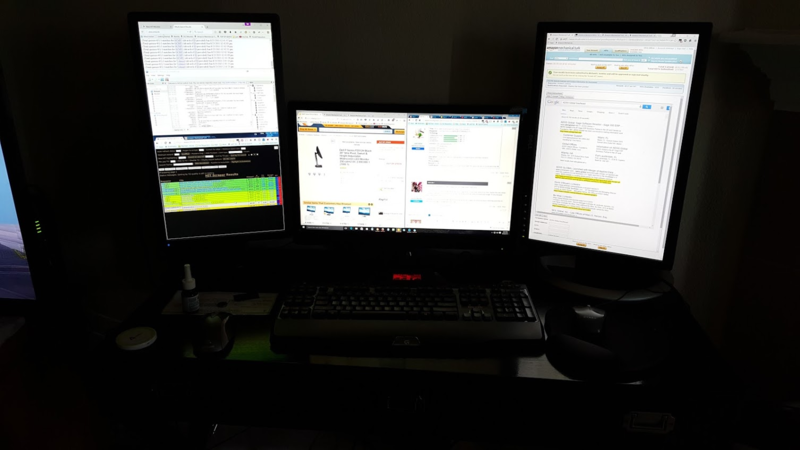 Have many monitors do you use to turk? Why yes, that is a typo. Should be HOW many monitors. 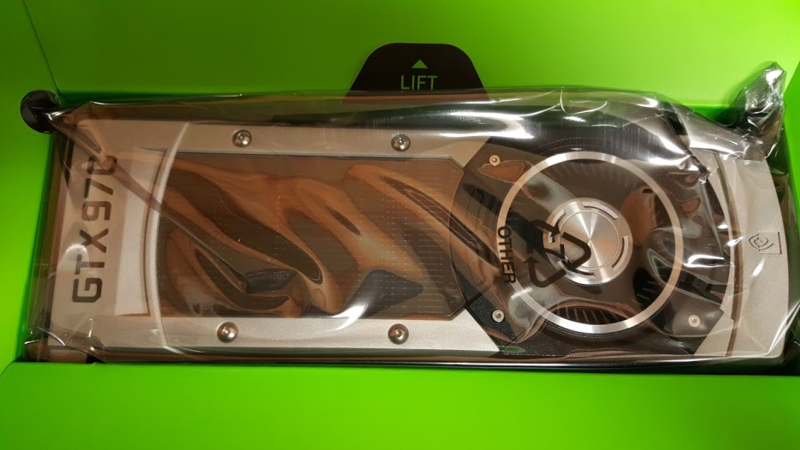 Thought it would be nice to have a place to ask about computers, discuss the gear you turk with, and share your desktop pictures. 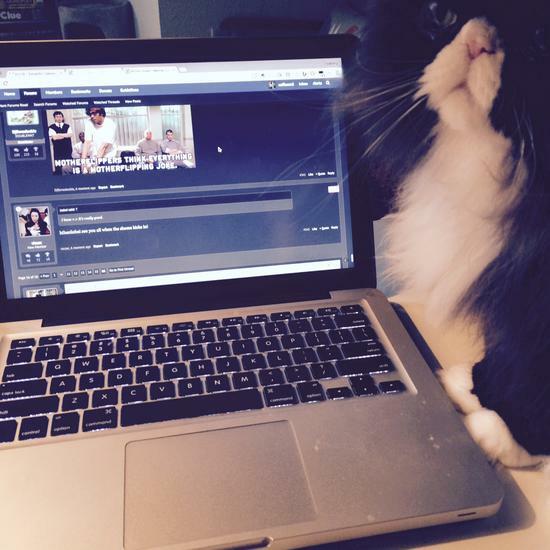 This is my oh so dirty MacBook Pro and my mouse, er cat who lives on my desktop. 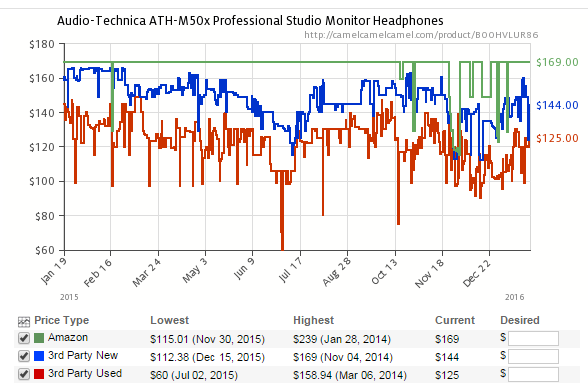 I want to get some new headphones ASAP for transcription hits and one day soon another monitor. Post away! Please help one another with questions and show us the desktops! Goose, MsAlys, jklmnop and 5 others like this. 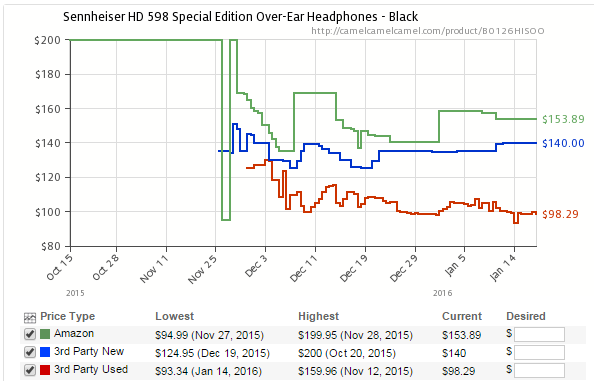 @YAHU probably has some headphones suggestions. coffeeowl and YAHU like this. Cmoney, hello, clickhappier and 1 other person like this. 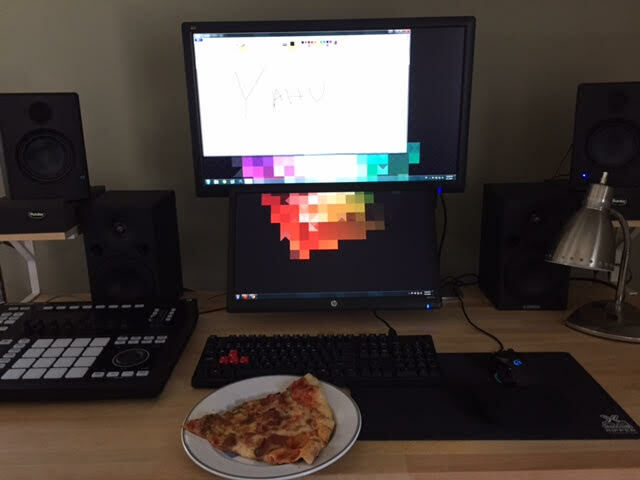 Nice setup and of course there is pizza! HEHE! My old pair of headphones were Sennheisers but they are ded ded ded. Not sure the model I had exactly but they sometimes had a weird echo. As for the pedal, I will keep that in mind. Thanks for the suggestions! 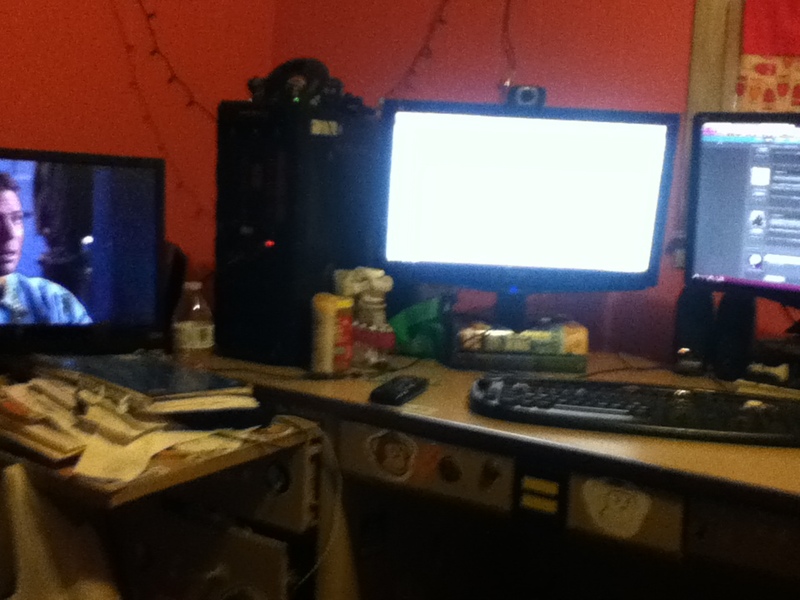 2 monitors, but i totally want 3.
sometimes i use my laptop too, and that goes on the left where allll those papers are. theturkscribe, clickhappier and coffeeowl like this. i used these for about 4 years. i LOVE them. can't say how they are for transcription, but the sound quality for music/gaming/movies is brilliant. Thanks! Nice setup too! My TV is directly in view in front of my desk (which is behind my couch) so Netflix and Turk FTW! coffeeowl and Cara like this. I have Sennheiser HD558s and I love them. Great sound, super comfortable. Found the ones I had before the TR 120, they were a gift and ok not great. Definitely need to step my game up. Thanks! jml and YAHU like this. Cmoney, hello and coffeeowl like this. This thread needs MOAR desktops! Share you pics peeps! I use two 23" monitors on a cheap mount, cheap Amazon speakers and keyboard, and a Logitech "Performance Mouse MX" all atop a piece of artisanal Home Depot plywood with $4 Ikea legs. 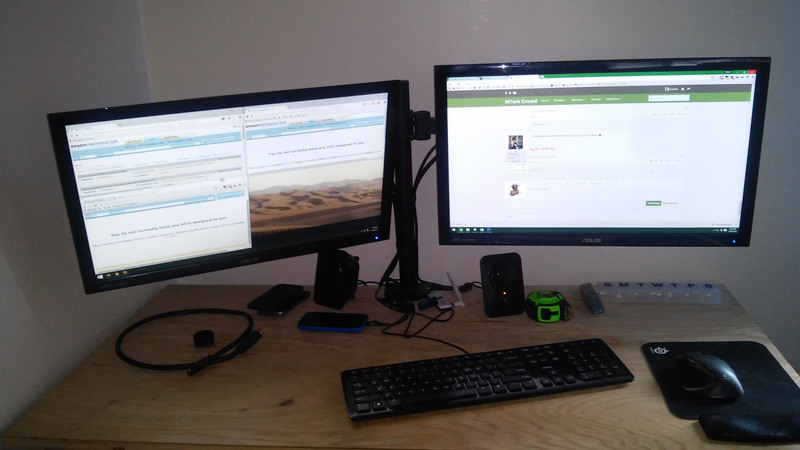 The left monitor is quite droopy because I just moved and haven't unpacked my tools to tighten it. PhantomCatt, clickhappier, coffeeowl and 2 others like this. 3 monitors and 2 in portrait. 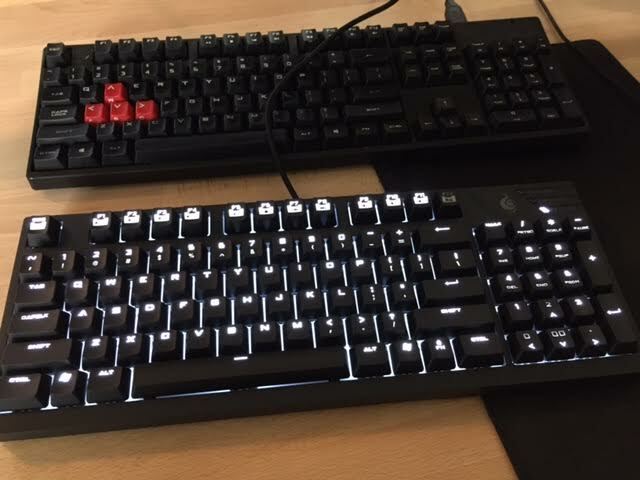 G510s keyboard so I can use tons of macros. Spoiler: Added this for my birthday this past New Years eve. mTurk8705, Cmoney, Goose and 9 others like this. All I get is a 'you can't see this image' do-not-enter symbol kind of thing... could you rehost a copy on imgur? coffeeowl and clickhappier like this. DIY desks are great! One of my all time favorite desks was an old door on cinder blocks. Cubbies for stuff in the blocks and tons of room to spread out. You all are making me want another montior bad!